7.29 points at 31 votes (rank 264). On the path of Goondock's children... Beware of the Yellow King. The Goonies are a group of kids or youths. Everything starts with an unscrupulous property shark who wants to purchase the kids' housing complex and the parents lack the money that is needed to prevent the pending sequestration. In the house of their leader Mikey the group makes an unusual discovery. They find a treasure map which is supposed to lead to the hideout of "One-eyed Willie", a pirate. Mikey can convince his friends to go for a treasure hunt. This starts in an abandoned restaurant. The evil Fratellis have settled in there. So after all Goonies, except for Chunk who is supposed to call the police, have entered a system of catacombs through a manhole in the restaurant, the adventure really begins. So the kids do not only have to beware of mean traps and bats, but also of Mama Fratelli. A good conversion of the movie The Goonies in a video game. 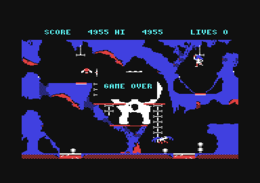 Multicoloured 2D graphics, whereby each level covers one screen. 8 rather tricky levels need to be solved and can demand a lot from you. The music is not bad, but unfortunately it gets a bit monotonuous after a while. You play two of the Goonies in turns, but you can only solve the tasks with teamwork. In almost every level each Goonie has the abilities to solve all types of tasks, only in the last level the assignment of the tasks is fixed. Points are also awarded in different scenes after a task is solved. SCENE ONE - Mama Fratelli is greedy and mean, Money will get her off the scene; Quench the embers; run, run, run; And you'll find your task is done. SCENE TWO - Rocks that crush, pots that pour, Bats that fly, you can't ignore. SCENE THREE - Duck the bullets, dodge the steam, Burst the pipe, and leave the scene. SCENE FOUR - Back and forth the Goonies race; A cannonball will set the pace; Clear the tunnel - knock out slats; Get out quickly; watch for bats. SCENE FIVE - Build a ladder, build it high, Before the rungs turn red and fly! SCENE SIX - Deadly slime plays music sweet, Floors appear beneath your feet. SCENE SEVEN - Eight arms guard the pathway out; "Flush" him down the water spout. SCENE EIGHT - Pirate's treasure, jewels and gold; Mama wants all she can hold; Sloth can make her leave her post: Offer what she likes the most. Here the Goonies need to reach the tunnel below the house. Go with one of the Goonies into the second floor and push the armchair (left) to the right below the ladder to the attic. Now go onto the ladder and up to the money squeezer. This starts to print and Mama Fratelli is distracted. With the second Goonie go down to the ground floor to the left behind the water tank. Knock it over by jumping at it into the right direction and the fire will be extinguished, the entrance to the tunnel appears. Now enter the tunnel first with the lower, then with the upper Goonie and go to the far right. You have to reach the key (middle left) to open the door at the bottom left. First place a Goonie above the triangle, to the ladder at the bottom right and to the spindle. The rock at the middle right above the swimming ball is lifted. Place the second Goonie onto the ball and cross the lake with it. Stand on the ladder at the left and jump to reach the bar. Then take the key and go to the exit at the bottom left. Go to the exit with the second Goonie. To get through this scene you need to make the pipe at the right side burst. For this, two vents need to be closed. The first is in the middle left cave and the second at the upper right. Just place one Goonie at each vent. To make it not too easy, there are horizontal shots and acid drops from above. You need to remove the three planks that block the tunnel that is at the lower left. To make this you need to direct the small rocks that roll down the cave into the lower middle exit. Place one Goonie below the chain in the uppermost floor and another Goonie in the second floor directly underneath. If a rock rolls from the top right, make the uppermost Goonie jump and a gap opens in the ground. The stone rolls from the right to the left into the second floor. There let it bounce off the wall so it rolls to the right, then jump with the second Goonie and again a hole in the ground appears. The rock rolls from the left to the right into the lowest floor. Now the Goonie from the second floor instantly needs to get below the chain in the lowest floor. In the meantime, the rock will rebound at the lower right and roll again to the left. By jumping at the chain the whole in the rock at the left can be closed and the rock can be "caught" in this floor until the Goonie from the uppermost floor has arrived in the "cellar" where he has to enter the white skid in the middle of the lower border of the screen. This makes the flap swivel into the other direction. When this is done, the Goonie, that has until now "caught" the rock, can let the rock that has to move from right to the left roll through the hole in the ground which is created by jumping at the chain again. The rock then rolls through the middle hole and triggers a lever that removes a plank from the exit. This process needs to be repeated three times to remove all planks. The whole thing needs to be done fast, as the bats are set free when the bell is chimed and the Goonies are reatively helpless at the bats' mercy..
You have to pile up the small geometric eggs, that the big bird drops next to the tunnel at the lower left, at the lower right. To realise this, let one Goonie jump on the trampoline in the upper right room until he dangles from the bone above. Below a bridge is forming above the lava at the right. Take the eggs and throw them all into the lower right room and push them to the far right next to the lava in front of the rock wall. They will pile up automatically. If the bird drops the eggs into the wrong room hang the second Goonies at the left bone for some time, so that the bridge over the lava at the left opnes and the bird is forced to drop the eggs at the right. When you have piled up five eggs, lead the one Goonie over the right lava bridge and make him climb up the eggs, the second Goonie can also jump over the lava to get to the exit. Place the first Goonie on the red platform. When it dissolves he will fall down to the lower blue platform. Climb up the ladder and make the Goonie jump. Now he hangs on a lever and the door in the lower middle opens. Go the same way with the second Goonie and through the door. Now he appears at the upper right. No down (the small gaps can be jumped over) and make him jump and hang at the lower right lever. This lever also opens the door. Now go with the first Goonie through the door and also down. Wait for the sporadically appearing platform and jump to the exit. You need to get to the tunnel at the right side of the screen but an octopus blocks the way. To pass it you need to let out the water from the small pond by jumping on the blue flipper-like lever. But the flippers cannot be simply pressed down, as they are secured below with a spring. Now one Goonie needs to hang at the bar below the lever, but he can only reach it, when the box below the "flippers" has fallen down. So first climb with the second Goonie onto the ladder, then on the rather small bump and jump from there onto the blip of the rock. The right flipper serves as a trampoline and from there the Goonie reaches the bar above the flippers. The box now drops and can be pushed by the second Goonie to the correct place below the left flipper. The upper Goonie now jumps onto the flippers and the octopus is drawn into the depth. Now to the exit with both Goonies. The octopus can be jumped over. The final scene. 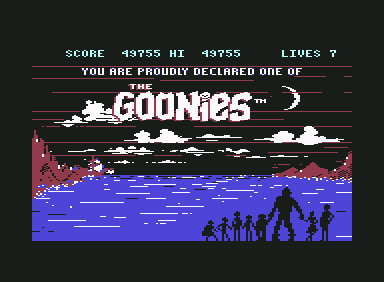 In this screen you need to get with both Goonies to the treasure at the top of the ship. The first action is to send the small Goonie to the cabin in the middle of the ship and let him move the lever. In the middle left a porthole opens. Go with the big Goonie through the porthole, up the ladder at the right and jump up in the upper room at the back, the porthole over him opens. Now go with the smaller Goonie through the now open porthole into the backmost room in the lower part of the ship. Follow with the big Goonie and there open the porthole to the lowermost part of the ship by jumping up onto the rope. Go with the small Goonie to the far bottom and jump up again, by this the port stays open and the big Goonie can also go into the lowermost part. Both Goonies are now in the bunt of the ship. Now go to the right and far up to the upper treasure chest with the big Goonie (the Fratelli-Mum will let the big Goonie pass). A few coins will be taken from the chest and fall into the water and the Fratelli-Mum will jump after them. Go with both Goonies back to the lowest part of the ship, let the small one hang at the rope and with the big one go above the room with the lever that the small Goonie has pulled previously. Then position the small Goonie on the small sail mast that looks out in a rectangular from the main mast into the right direction. (From the upper right chamber of the ship you can walk to the left on deck although the wall looks massive!) When he is standing on the small sail mast, then move the lever again with the big Goonie (just jump down). The small Goonie is transported upwards and can them jump to the right to the upper right treasure chest. No go also with the big Goonie to the upper treasure chest. Now you are declared a Goonie and can admire the end. Then the game starts again with scene 1. Only for the U.S.Gold version: You can choose the levels with F7 - pressing it once has the effect that you start in level 2, pressing it twice in level 3, etc. This is actually a bug (or a feature?, see the manual of the Remember version). TheKills: "Ingenious movie and ingenious conversion for the C64!" Shakermaker303: "The movie was better. But I never played the game to the end. At least it has better graphics than the one on the Atari 800XL. There the bright chair in level 1 looked like a sheep :-)." Shmendric: "On the one hand one of the funniest games at all, on the other hand unfortunately far too easy. I have played it trough at the first try without any problems, the puzzles were very simple. However, an ingenious movie conversion!" Klaws: "After Ghostbusters another game that proves that conversions of movies do not have to be grotty. 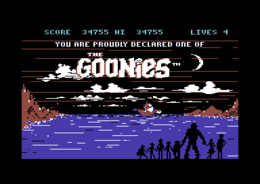 In fact, The Goonies is so much fun to me, that I have played through it several times; first alone, then later with a friend in the cooperative two-player mode. Yes, the music tootling gets dispensable after some time, but anyway full 10 of 10 points!" H.T.W: (Critic is for the Datasoft version) "A top puzzle game with superb levels that make knots in your brain's convolutions, that slowly rise in difficulty, whereby level 8 needs some thought acrobatics. Additionally, you also need intuition and joystick control. A very good game with long lasting motivation!". The "F7" key that is supposed to restart the game in level 1 raises the start level. I.e. after pressing this key, the game starts in level 2, after pressing it twice in level 3 etc. The game starts with 8 instead of 5 lives. The third demo screen (scene 2) is not shown correctly. 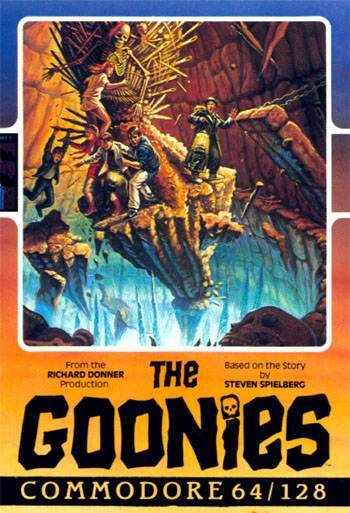 The second Goonie is killed every time he wants to avoid the first rock. The life counter is not limited. After 9 lives that letter "a", then "b" etc. is shown. If you press the “F3” key in the title screen once, the game switches to a two-player synchronous mode (with two joysticks). As both Goonies can be moved independently at the same time, the game gets much easier by this – provided there is good teamwork. The Goonies in the Killer List Of Videogames. This page was last modified on 6 April 2015, at 13:48.